The Addams Family Musical opens to a stage draped with swishing cobwebs and the sounds of screeching hinges and howling wind, the perfect introduction to the following hours of brilliantly spooky theatre. 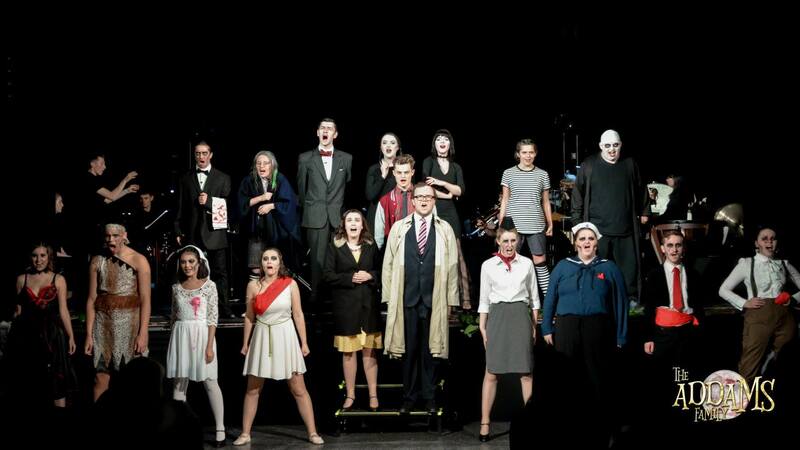 The Musical Theatre Society’s main term show elicits laughs and gasps as it presents the wonderfully eccentric Addams Family and Wednesday Addams’ quest for her ‘normal’ boyfriend Lucas to be accepted into their frightening fold. This proves to be easier said than done when Lucas’ conventional, suburban parents enter the macabre Addams mansion and tensions rise. Family bonds are tested, marriages reach breaking point and young love is on the verge of being torn apart by the events that unfold on stage. The audience is treated to the standout performances of the three onstage couples: Gomez and Morticia Addams (Tom Avann and Emily Quillin), Alice and Mal Beineke (Emily Bradbury and Reuben Havelock) and Wednesday Addams and Lucas Beineke (Becky Hinde and George Lambourne). Tom Avann and Emily Quillin showcase simmering chemistry which culminates in a passionate tango that brings the roof down. Meanwhile, Emily Bradbury perfectly captures the ‘desperate housewife’ in Alice Beineke, who transforms from a sickeningly cheerful poet to a sassy woman who isn’t afraid to stand up to her humdrum husband. Becky Hinde and George Lambourne deliver a convincing portrayal of a young couple in love who are fighting for their future against the wishes of their dysfunctional families. The supporting characters also shine. Fester Addams (TJ Egglishaw) and his plaintive declarations of love for the moon, Lurch’s (Josh Berrington) demonic glares, Pugsley Addams’ (Ellie Taylor) tortured personality, and Grandma Addams’ (Maddy Biggs) comical staggering all add flavour and additional humour to the musical. All soloists in the play deliver excellent vocal performances and are supported with rousing harmonies from the ancestors, who form the ensemble. The ancestors, in their own right, contribute greatly to the performance: singing, setting up stage and participating in quirky, energetic dance numbers. The Addams Family Musical was a highly entertaining event on campus and exhibited the talent the Musical Theatre Society possesses in performance, vocal ability, choreography and direction. Definitely worth the watch!